The boys called this “chicken spaghetti”…and it was pretty close…minus some cheese. This would be great topped with some shredded cheddar or grated parmesan! Since we’re dairy-free, I left it out! 2 chicken breasts, cut or diced into small pieces ($1.20) Remember that great chicken deal last week! 4 corn cobs ($.68) On sale last week for $.17 an ear! In medium saucepan, bring water to a boil. Add pasta noodles and cook according to package instructions. Drain and return to saucepan. In large skillet, add olive oil and cut or diced chicken pieces. Season with salt and pepper. Saute until all chicken pieces have cooked through. Once cooked, remove from skillet and set aside on nearby plate. In same skillet, add butter or margarine. Let melt over medium heat. Stir in flour, creating a paste. Whisk in milk. Whisk until paste “dissolves.” Let cook over medium heat for 4-5 minutes, or until begins to thicken. Add shredded carrots, crushed garlic and cooked chicken to the white sauce. Stir through and let simmer for 5-10 minutes, or until reaches desired consistency. Stir chicken and sauce into cooked noodles. Remove husks and boil corn cobs for 4-5 minutes in large saucepan. 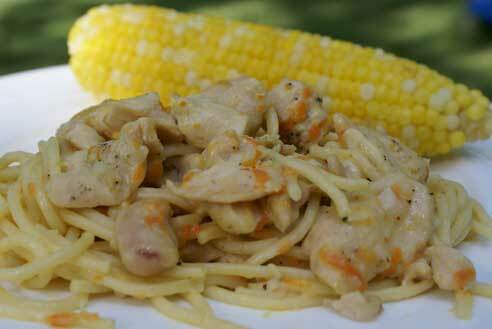 Serve Chicken Tetrazinni with Corn on the Cob. I call it chicken spaghetti too! would you mind if i copy this recipe? Thanks for sharing. I just went through my pantry this morning and this is another recipe I can use next week so I don’t have to go grocery shopping. I might cut some corn off the ear and saute it a little and mix it in with the spag…looks yummy -thanks for the great blog! When I saw the title of the post, I was excited yet waiting for disappointment. Since I can’t eat condensed soups anymore (allergies), I can’t use/eat a lot of tetrazzini recipes – seems like most of them want you to dump in a can of soup. I’m SO glad to see that you made your own sauce! I’m going to check to make sure I have all of the ingredients, and this is going on the menu for next week! Thanks! I have never used a can of condensed soup in ANY recipe Jean! All my recipes have homemade sauces! I am new and I absolutely love this website. My whole menu for this week is from your index! Tried this recipe tonight, and LOVED IT! I have a VERY picky 14 month old and he gobbled it up. It makes a moms evening to see her kids eat well and enjoy it. My husband went gaga as well. Great recipe; what else ya got! !